Writer/director James Gunn took the best parts of B-movie Night of the Creeps and David Cronenberg’s They Came from Within, mashing the pieces into the exquisitely funny, gross and terrifying Slither. A Troma alum with writing credits ranging from Scooby-Do movies to the remake of Dawn of the Dead, Gunn possessed all the raw materials to pull it off. The film is equal parts silly and smart, grotesque and endearing, original and homage. More importantly, it’s just plain awesome. Cutie pie Starla (Elizabeth Banks) is having some marital problems. Her husband Grant (the great horror actor Michael Rooker) is at the epicenter of an alien invasion. Smalltown sheriff Bill Pardy (Nathan Fillion) tries to set things straight as a giant mucous ball, a balloonlike womb-woman, a squid monster, projectile vomit, zombies, and loads and loads of slugs keep the action really hopping. Gunn lifts certain scenes – the best scenes – directly from both the Cronenberg and the lesser Creeps effort, but never steals. 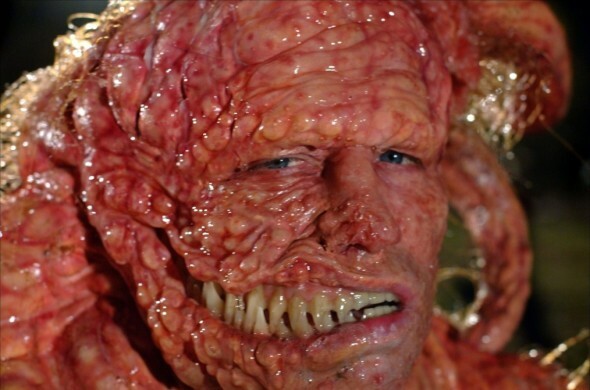 His film brims with affectionate nods, including the great early scene where white trash Margaret sits on her couch with her toddler watching Troma’s classic Toxic Avenger. Classy, mom! Consistently funny, cleverly written, well paced, tense and scary and gross – Slither has it all. Watch it. Do it!